Encased in lucite, this 1.142-gram moon rock was returned to Earth by Apollo 17 in 1972 and presented to Cambodia a year later. A small moon rock gifted to Cambodia by the United States amid the Vietnam War has resurfaced after being all but lost to time and strife. Officials representing the National Museum of Cambodia in Phnom Penh and the U.S. Embassy in Cambodia unveiled the museum's display of the "goodwill" moon rock on Monday (June 18), following an extensive effort to determine its origin. "We can now reveal today, for the first time, the history of this unique gift from the United States to Cambodia," said Newbill at the exhibit's opening. Before they became the final two humans to depart the moon in December 1972, Apollo 17 astronauts Gene Cernan and Harrison Schmitt paused their exploration of the Taurus-Littrow lunar valley to dedicate one particular moon rock as a symbol of "peace and harmony" among countries "throughout the world." Radioing back to Earth, they announced that a portion of the rock would be shared with many nations and offered their wishes for goodwill among "all mankind in the future." Three months later, then-U.S. President Richard Nixon directed that fragments of that goodwill moon rock be distributed to 135 nations and the 50 U.S. states. On July 19, 1973, a month before the U.S. ceased bombing Cambodia as part of "Operation Freedom Deal," an expansion of the Vietnam War and Cambodian Civil War, U.S. Ambassador Emory Swank presented Cambodia's piece of the moon to the country's education minister, Keo Sangkim, in an official ceremony. 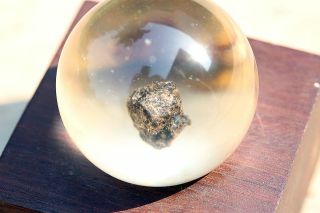 The 1.142-gram rock, embedded in a clear lucite sphere, was gifted on a wooden plaque with the flag of the nation that was flown to the moon on Apollo 17. "The program and gift that your excellency has just given to the Khmer people is a symbol of the sincere desire of the United States of America to promote peaceful cooperation among the nations of Earth in order to achieve eternal peace on our planet in general, and a stable peace in Southeast Asia, in particular, a peace to which the Khmer people aspire," wrote Lon Nol, the then self-proclaimed president of the coup-founded Khmer Republic, in a letter to Nixon in July 1973 (translated from French). "Also, you can rest assured that we will keep the present gift of the great people of United States of America as the most precious gift we have ever received," wrote Nol. Cambodia's Apollo 17 moon rock may have remained lost were it not for a French researcher working in the National Museum. "He realized that there was no background information at the museum about the history of the lunar sample — not even information confirming that indeed it was a moon rock," said Monica Davis, the Cultural Affairs Officer at the U.S. Embassy in Cambodia. The researcher alerted the French Cultural Attaché in Cambodia and was referred to Davis, who at the request of the museum began searching for the origin of the sample. "It was not immediately clear this was a moon rock, although its appearance was quite similar to pictures from Apollo 17 lunar samples," Davis told collectSPACE.com in an interview. "Usually moon rocks from the Apollo 17 mission came with a plaque with a flag and quote from the president. This one had a different wooden podium and therefore we were not sure if this was an original moon rock or not." "He stated that the size and shape of the plastic are correct, and the coloring and morphology of the sample and grains in the sample match other examples," Davis explained. At the same time, the U.S. Embassy conducted extensive research in the National Archives and Library of Cambodia, the U.S. Library of Congress and U.S. National Archives, the U.S. State Department, the Nixon Library, and the Center for Khmer Studies. After six months of searching, they were finally able to find old U.S. State Department cables about the gift as well as an article from an August 1973 edition of the "Khmer Republic" magazine about the presentation of the moon rock to the Cambodian government and the circumstances of that ceremony. Michael Newbill, Deputy Chief of Mission at the U.S. Embassy in Cambodia, cuts the ribbon opening the goodwill moon rock exhibit at the National Museum of Cambodia on June 18, 2018. The rediscovered moon rock's exhibit is part of the upcoming 100th anniversary of the National Museum of Cambodia to be celebrated in 2020. It is also a symbol of the United States' longstanding goodwill to Cambodia and its people. "We hope that this exhibit inspires young Cambodians to dream big," said Newbill. "Don't let the boundaries of what you think is possible stand in your way." In researching the moon rock's arrival, Davis came across recommendations from the U.S. State Department as to what to say at its original presentation. "This small moon rock is a symbol representing the knowledge shared by men of science and technology over the centuries, and their search for knowledge," read a 1973 cable from the U.S. State Department. "Perhaps the spirit of Apollo, which surmounted the barriers of deep space for man, can eventually help eliminate the barriers between nations." Though it has been 45 years, the moon rock's message remains the same. "The Embassy has prioritized Science, Technology, Engineering and Math (STEM) outreach and programs in order to further Cambodia's development. We hope that visitors will be inspired to pursue a STEM career by observing a successful STEM project like the mission to the moon," said Davis. "Visitors to the National Museum's exhibit will also gain a better understanding of the amazing challenges the astronauts on the moon mission had to overcome and how they broke the limits of what humanity once thought was possible," she said. See more photos from National Museum of Cambodia's moon rock exhibit at collectSPACE.